POM Wonderful really is wonderful. I remember the days before POM, when I was a kid, and I had to get on my “dirty clothes” and sit in the bathtub just to eat a pomegranate. Seriously, actual fact. Now, you can buy all these great pomegranate related products, all the antioxidant and yumminess without the blood-like stains. Win, win. I made these during Rosh Hashanah. I’m not Jewish, but I have recently had the honor of learning about all the beautiful food traditions the Jewish religion has. I had lunch with my friend Tori, of The Shiksa In The Kitchen, the other day and she told me all about eating pomegranets during the Jewish New Year to “to remind ourselves that our good deeds in the coming year should be plentiful.” Now, who can’t get behind that? Wouldn’t the world just be a better place if we all took a second to remind ourselves to do more good deeds in the coming year? 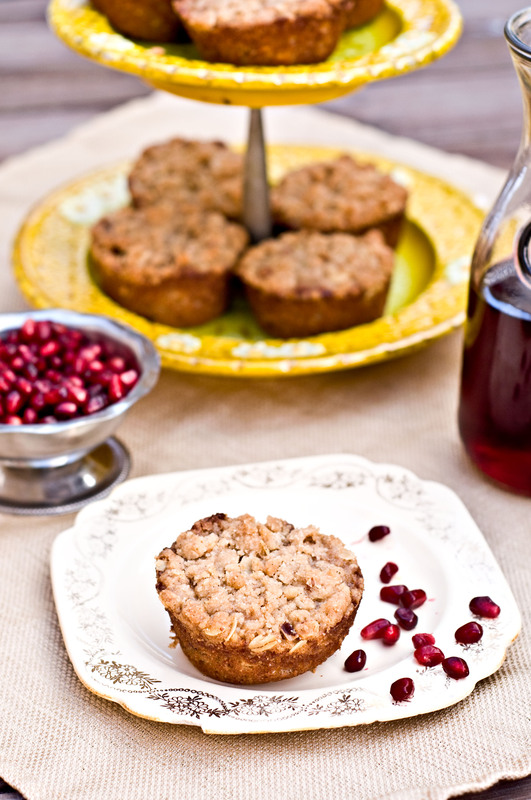 Besides the beautiful symbolism of eating pomegranates during the High Holiday, these muffins were awesome. I was so happy with how they turned out. In a bowl add the white sugar, brown sugar, flour, baking powder, almonds, cinnamon, pecans, oats and salt. Stir to combine. Add the butter cubes and using either your hands or a pastry cutter, rub the butter into the flour mixture until it is well combined and resembles crumbs. Measure three cups of the crumb mixture into the bowl of a stand mixer. Put the rest of the crumbs into the refrigerator to chill. Add the eggs, sour cream, vanilla, and pomegranate juice to the mixer. Mix on medium/low speed until just combined. Don’t over mix. Add the pomegranate seeds and stir to combine. Spray the wells of a muffin tin with butter flavored cooking spray. Add the batter to the wells until about 1/2 way full. Top with the chilled crumbs until the wells are filled to just below the top, about 1 or 2 tbs of crumbs. Bake for 22-25 minutes, or until a tooth pick inserted into the center of the muffin comes out clean. Allow to cool before serving. That’s so nice coming for you, I ADORE your food photos, you are such a pro! I believe this is the first baked good I have seen made with pomegranates. 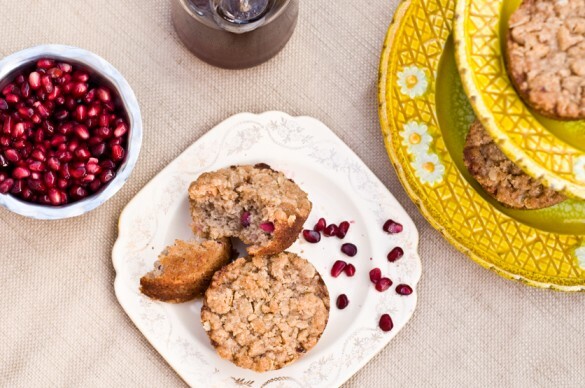 These muffins have a nice rustic look and I love pomegranates! Thanks for sharing. Oh my, these look wonderful! We love fresh pomegranate and I would enjoy cooking with it. Thanks! These are so beautiful. You really take stunning photographs. Such a wonderful recipe. And great mention for Tori. The Shiksa rocks, I love that lady. Her recipes and facts are always incredible. Hope you have a great week. Thank you, Kim! My photography is still such a work in progress, so much more I want to learn. And Tori, isn’t she great?! It’s amazing that someone so beautiful can also be so smart and so nice. And so giving of her time and knowledge, such an inspirational person! This was my first time bakign with pomegranates also, I think I’ll try it again for sure! I was lucky enough to try these delicious muffins. 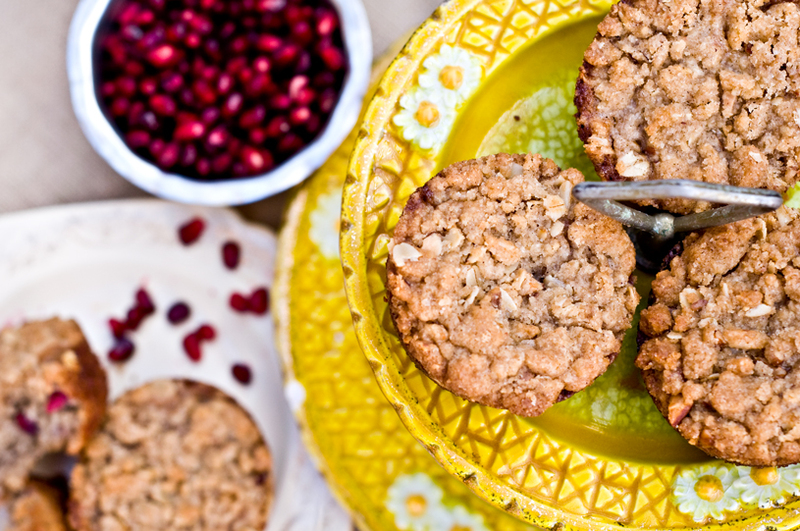 The crumbly streusel topping is scrumptous and the pomegranate seeds give the muffin a great flavor. Good job Jax. So proud of you! !